This interesting and highly collectible “Prince Albert” style watch chain and fob is now on display in our Estate department. Though we have no direct provenance, because of the appearance and quality of the gem inlays and fob plus the fine craftsmanship, we’re pretty sure the piece is of California gold-in-quartz set in karat gold, manufactured in the last half of the 19th century. The gold rush of 1849 brought a stampede of people to California, including a good number of skilled goldsmiths and jewelers who settled in and around San Francisco. The Mother Lode of the Sierra Nevada produced beautiful veins of pure native gold embedded in a matrix of white, rose, or dark quartz. 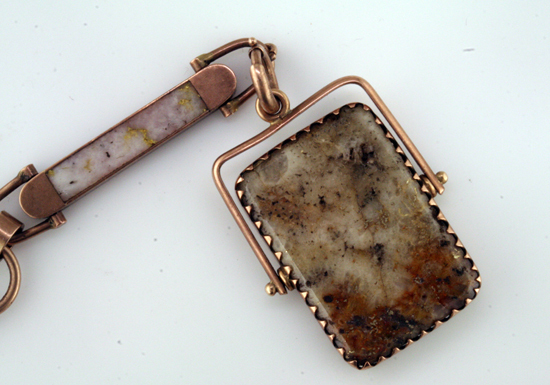 The Forty-Niners were quick to take advantage of this unique raw material, fashioning all sorts of jewelry and objects such as walking canes, match boxes, and the like, inlaid with this wonderful gold-in-quartz. The heyday of gold-in-quartz jewelry was cut short by the great San Francisco earthquake of 1906. The bezels and chain of this great piece are of 10K rose gold. You can see the various colors of quartz in the panels along the chain, shining with the bright speckles and patches of pure gold. Imagine the excitement of the miners when they saw this gorgeous sunny gold color laced through the hard rock. 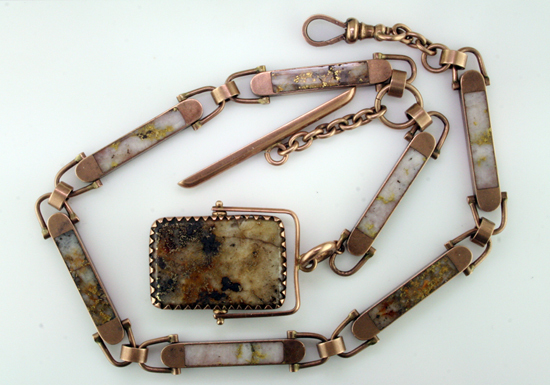 Note that both sides of the bezels of the chain are beautifully inlaid with gold-in-quartz, and that the fob stone is mounted in a swiveled “flip-flop” bezel. We like the stirrup and bit design very much — truly Old West! The current production of gold-in-quartz is minimal, so newly mined material is rather scarce and very pricey– good stones are sold by the carat! The Three to One Mine of Grass Valley, California is known for producing high quality gems. The Gympie district of Australia and several sites in Alaska produce gold-in-quartz, but the best California material has always been considered superior by aficionados. Period pieces like this one have soared in value, as the demand for rare items and fine estate jewelry has grown. We are always on the lookout for new and interesting “old” items for our Estate Department— If you have estate jewelry or items you wish to sell or consign, please give us a call. We’ll be happy to consult with you on ways to realize the best return for your pieces. The gold market is hot right now, so it’s a great time to sell! This entry was posted on Saturday, September 19th, 2009 at 4:11 pm	and is filed under Estate Jewelry, Gemstones, Jewelry Facts. You can follow any responses to this entry through the RSS 2.0 feed. Both comments and pings are currently closed. « What is the True Padparadscha? Again!